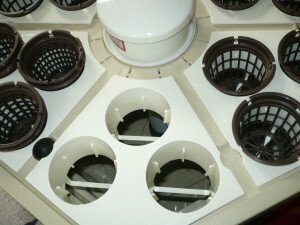 I have been using a RainForest aeroponic system from General Hydroponics for cloning and vegging and I wanted to share a review of my RainForest 318. This is an aeroponics deep water culture hybrid that produces excellent results. The RainForest is almost an exact copy of the Ein Gedi System, developed in Israel. Many people think NASA invented hydroponics. They did pioneer high pressure aeroponics for growing plants in space, but aeroponics got its start in Ein Gedi Israel where growers were looking for a way to conserve precious water. 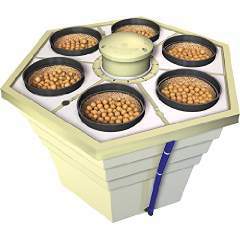 The Ein Gedi System is a low pressure aeroponic system and is a hybrid of aeroponics and DWC. It uses a spinning disk called a Vortex Sprayer to deliver a fine spray to the roots which hang suspended in the air. The fine mist it produces is excellent for cloning weed. But there is also a reservoir for the roots to grow in once they get longer. Water is pulled up a spinning tube from the reservoir and spayed on the roots it then rains down gently on the reservoir, aerating it. The system was later patented and only General Hydroponics manufactures it. I think this aeroponic system is the best combination of aeroponics and hydroponics around. No Sprayers To Clog – Both high and low pressure aeroponic systems rely on sprayers or sprinklers to water the roots. Filters are needed to keep them from clogging and even then they sometimes clog. There’s nothing to clog in a Vortex Sprayer. Water is pulled up a spinning tube by centrifugal force and disperses through large slots to the rotating spray head. No Expensive Cycle Timers Needed – The RainForest can be left running 24/7. No one minute on and 5 off cycles to raise your power bill or wear your pump out. No Air Pumps Or Air Stones Needed – The Vortex Sprayer pulls up water from the bottom and the water returns to the surface like fine rain drops. The reservoir is always being aerated and recirculated without the use of air pumps or air stones. No Complicated Plumbing – There is no complicated plumbing to leak, no accumulator tanks, no solenoids and no high pressure needed. There is only one drain tube in the RainForest and it won’t leak because there’s no pressure build up in the system. The RainForest Is Compact – The RainForest measures only 22 inches across the top and 15 1/2 at the base. It is 17 inches high. The RainForest can easily fit in just about any closet if that’s all the space you have. Your Crops Will Yield More, Faster – High and low pressure aeroponics growers may argue about which system is better, but all will agree that your plants will yield 2 to 3 weeks faster than in soil and give at least 20% more than similar sized plants in other systems. 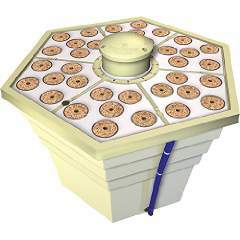 Easy To Use – This is a very easy to use aeroponics system. 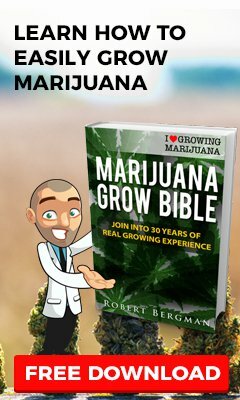 Great for newbies or experienced growers. There is nothing complicated here. All you need to do is monitor your nutes and keep the water level between 10 and 13 gallons. That’s it, KISS at its best. Aeroponics doesn’t have to be scary or complicated to produce amazing results. I think you will agree that the RainForest has some real advantages over other aeroponic/hydroponic systems. I can’t think of a single system that allows you to clone, raise transplants or flower that is as efficient or compact. If you are a larger grower these units can be linked together and maintained through a central reservoir. I purchased the Rainforest 318 and I will tell you why I think this is the best all around configuration. First, if you are not familiar with aeroponics, the roots hang down and are misted or sprayed. So the size of the pot has little to no bearing on plant size. The RainForest 66 has only 6 plant sites and uses 6 inch net pots, which is a waste of space unless you plan on growing your plants to full size. If you want to root clones you will be limited. The unit comes with coco inserts that have 5 knock outs so you could root 30 clones theoretically but you will have to remove them as soon as they start to root or the roots will get tangled together. The RainForest 236 with 36 2 inch net pots would be ideal for making lots of clones and you could still grow larger plants in it but no more than 6 so again a lot of the space is wasted IMO and if you want to veg and get larger transplants they will be very crowded. The RainForest 318 will give you 18 single sites to raise larger clones or 90 total using the coco inserts but again you will have to remove your plants early. 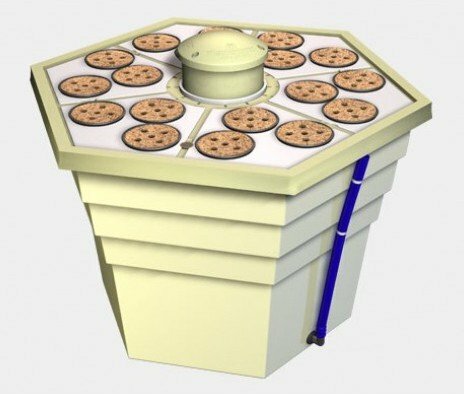 The 18 slots will allow ample room to veg your plants to a good size before flowering.You can still grow 6 plants to maturity by using inserts in the empty net pots. So this unit will allow you to make a fair amount of clones and grow larger plants so I think it will hit the sweet spot for most growers. For those who can’t make up their minds, the tops are interchangeable and you can buy them separately. Each top consists of 6 modules and they can be interchanged and mixed if you wish giving you the ultimate in flexibility. So I got my RainForest 318 and took some pictures along the way. First let me say this is a high quality product. There are no cheap flimsy parts here. The bucket and lid are made from thick heavy duty plastic and nothing like a cheap Rubbermaid tote. So here is what’s in the box: On left are the 6 modules that fit in the lid. The box holds the Vortex Sprayer and on top is the gasket it sits on. The white pipe with black fitting on the end is a root guard to keep roots from getting caught in the Vortex’s spinning shaft. Underneath that are 20 3 inch net pots, coco liners and coco inserts. Not sure why they give 20 for an 18 site planter but I appreciate the extras. Then there’s General Hydro’s Grow,Bloom and Micro nutes and two bags of hydroton. 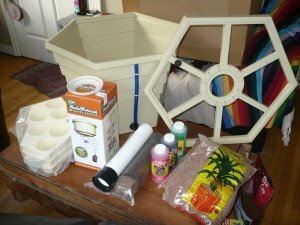 In short there’s everything you need to start growing except the water! Here is a close up of the lid assembly. You can see how the modules fit easily in the lid. Something I haven’t seen, at least in any DIY aeroponics projects I’ve seen are the support straps in the bottom of the net pot recess. I am not sure if I like them or not. They keep the net pots raised and are probably there to support the plant and its roots. They would be easy enough to remove but I am not ready to start cutting them just yet. As an update, after using this for a while I would definitely recommend removing them. The roots will become tangled around them, making it impossible to move the plants without causing damage to the roots. Here is the top of the RainForest with all the lids in and the Vortex in place. There is a rubber? boot that goes between the sprayer and the lid to seal it in place but it’s not real visible in this picture. This next picture below is of the RainForest 318 living in my closet. It has some newly rooted clones from one of my earlier grows. They were started in Rapid Rooters a week or two before I got the RainForest. They look a little haggard but they are doing OK considering they sat in plastic cups for 2 weeks before I got the RainForest. They came from my 12/12 grow so they were flowering but are being vegged now and starting to show new leaf growth. So far I really like the RainForest 318. It is a solidly built and compact unit. Considering all it can do I think it is reasonably priced. You can get it on Amazon for $235 with shipping included here. 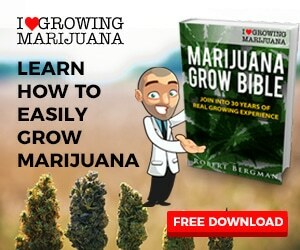 It is versatile and can be used for cloning, vegging or flowering. 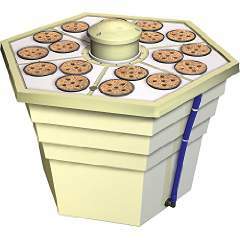 It can be fit in small spaces or units can be grouped together for larger grows with an external reservoir. It is fairly quiet too. The motor does give off a slight hum but it is barely audible. The motor, by the way runs on 12 volts dc, and comes with a plugin power supply. It can be run off solar panels if that’s your thing and also can be run off a UPS if you are worried about losing power. I had some problems with the lid vibrating but found by not pushing the Vortex Sprayer all the way down in its mounting boot it stopped and there are no leaks. The drain pipe does not really lock firmly in place and I did get wet socks before I found a wire from my lights had moved and lowered it. This issue was easily fixed by cutting a neoprene plug for the end of the tube. I do think there should be a ring to hold it in place. The only other issue is accessing the reservoir for water changes. You wont want to remove the whole lid to do this. I unplug the power supply and remove one of the modules. There is plenty of room to add water or get a hand in there. I have a siphon unit I use for my fish tanks that attaches to a faucet so draining and filling is easy. There is a small inspection port on the lid you can fit a hose in too and you can use a small transfer pump to fill and refill if you want. You could probably drain most of the res with the provided tube and use a turkey baster or something for the rest. Another option would be to buy a tote and hook it up with a grommet and fitting to the existing drain tube. Then all filling and draining could be done from there. If you want to flower in this I would suggest this method and then put scrog netting above the RainForest. In fact if you want to flower in this scrogging would be the best way to grow. Six plants will get really crowded in one of these if they are a large strain. Most Indicas would probably be OK but larger plants would need to be lollypopped and trained to a single cola. The RainForest is perfect for a closet grow because it takes up so little space. It is just under 25 1/2″ at its widest point and 22″ from one flat side to the other and stands 16 1/2 inches tall. 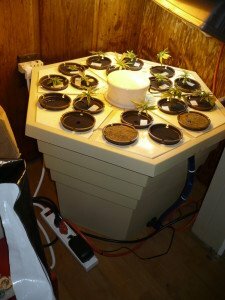 It is newbie friendly and easy to maintain and weed plants grow like crazy in this setup. In spite of a few minor problems I am very happy with my RainForest 318 and would not hesitate to recommend it to anyone. For me it allows me to have a small, highly productive space for cloning, raising transplants or keeping mother plants. I really can’t think of another unit that does so much and is so easy to use and I think if you buy a RainForest you wont regret it.